Ford's Dearborn, Mich., assembly plant is running three crews on four-day, 10-hour per day work schedules to catch up with demand for the 2015 F-150. 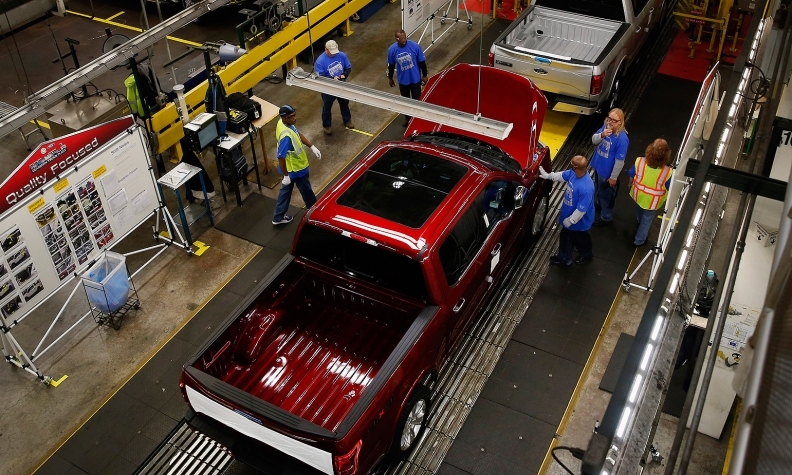 Ford Motor Co. is adding 1,550 hourly employees in the first quarter to increase production of the aluminum-bodied F-150 pickup, the company announced today. The hires will cause between 300 and 500 UAW members earning Tier 2 hourly wages of $19.28 today to rise to top-tier status with hourly wages of $28.50, said Bill Dirksen, Ford vice president of labor affairs. They would be the first entry-level UAW workers to advance to legacy wages under terms of Ford's 2011 UAW contract, which caps Ford’s Tier 2 U.S. production work force at 20 percent. Dirksen said 900 of the hires will be added at Ford’s truck assembly plant in Kansas City, Mo., which builds the F-150; 500 will join the company’s stamping and diversified operations in Dearborn, Mich.; and 150 will be added at Ford’s Sterling Axle plant in suburban Detroit. Ford’s Dearborn assembly plant is running three crews on four-day, 10-hour per day work schedules to catch up with demand for the 2015 F-150. The Kansas City plant will be on the same schedule when it moves from building preproduction F-150s to salable trucks later in the first quarter, Ford said. Strong sales have left just a 12-day supply of the 2015 F-150 on dealer lots, Ford said in a statement. Dirksen said consumers have configured one million F-150s on the Ford website. The hires will receive beginning Tier 2 wages of about $16 an hour. Their benefits are roughly half those received by longtime hourly Ford workers. Dirksen said the savings from the 2011 UAW contract and its Tier 2 wage provision have enabled Ford to invest an additional $6.2 billion in the United States to boost production. The two-tier wage provision -- included in a similar form in UAW contracts with General Motors and FCA covering workers in U.S. plants -- has contributed to Ford adding 15,000 hourly UAW members. That exceeds a goal of 12,000 by the expiration of the current contract in September, Dirksen said. Most of the workers advancing to the higher wage level were hired from February through June 2010 and work at Ford’s Kansas City, Louisville and Chicago assembly plants. Today, Ford has a UAW-represented work force of about 50,000. Of that, 14,454 are entry-level hourly employees. Ford is the only one of the Detroit 3 subject to a cap on Tier 2 workers. Its cap is 20 percent of its total hourly work force, excluding workers at several plants whose jobs were created by moving work in-house from suppliers or other countries. Those exclusions mean that Ford didn’t hit its cap until Tier 2 workers accounted for 28 percent of its work force. Automotive News reported Friday that Ford was close to reaching its Tier 2 cap and would have to transition workers to legacy pay. The Tier 2 system has been controversial since its inception. At the UAW Constitutional Convention in Detroit last year, UAW President Dennis Williams said the union would seek to more closely equalize pay between the tiers as part of this year’s negotiations with the Detroit 3. The four-year contracts expire in September. “The UAW Ford 2011 negotiations reaffirmed with Ford the process in which members move to the traditional wage levels, through the hard work of Ford, UAW members, the local and International union leadership," Williams said in a statement today. "Through the hard work of Ford and UAW members in creating a strong product line, new hires at Ford have triggered that portion of our contract. The company will be notifying those eligible and our members and their families will benefit."